Making Tracks takes young readers on a fictional journey through fascinating Australian stories, inspired by objects from the National Museum of Australia’s collection. The series was written and illustrated by leading Australian children’s authors and artists. Some titles are out of stock. Every title has classroom resources including a synopsis, discussion questions, worksheets and other classroom activities. Tibby feels like everything is going wrong. Her big brother Clarence is all grown up, and doesn’t want to play with her any more. If Clarence says there aren’t any pixies except in books, then what exactly did Tibby see in the bush, peering out from behind a leaf? See Tibby’s Leaf classroom resources. Maggie is working as a children’s nurse in the big house when she finds a copybook and decides to teach herself to read. She knows she shouldn’t really take the book, and things only get worse when the mistress sends her home in disgrace. See Turning the Page classroom resources. John loves to fiddle with things, but when he connects a broken webcam to an old telescope he is in for a shock. Suddenly he finds himself looking back in time, caught up in a very ‘cool’ Antarctic adventure. See Antarctic Close-up classroom resources. When George is sentenced to seven years’ hard labour in Van Diemen’s Land his only thoughts are of his sister Hannah. What can he give her to remember him when he is so far away? See A Penny to Remember classroom resources. Danny knows that he has to respect his uncle and do as he says, even if that means joining him on a sewing trip to the goldfields. Danny would rather be anywhere else ... until he takes things into his own hands! See Seams of Gold classroom resources. Trung’s adventure begins in the dead of night. He and his father escape the soldiers with guns. But what awaits them across the dark sea? 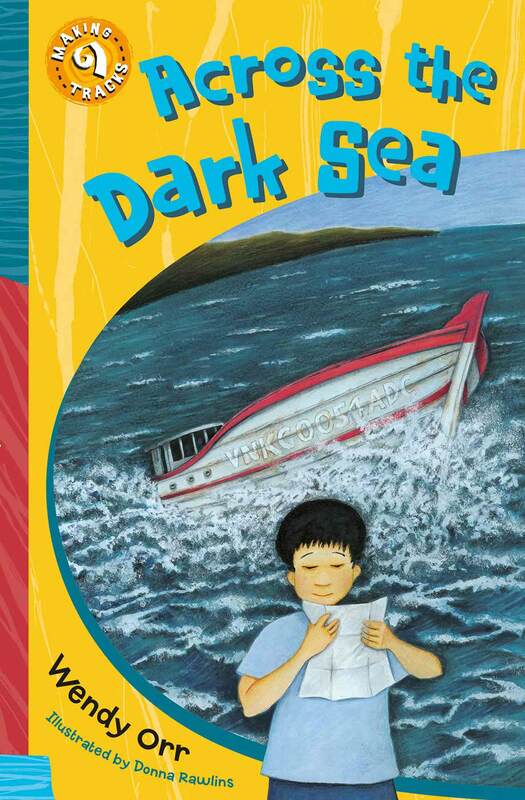 See Across the Dark Sea classroom resources. Polly and James accidentally overhear a gang of bushrangers plotting to hold up the Governor. Their first thought is to tell their parents and become heroes for saving the day. But then they find out their dad might be helping the bushrangers! They need to stop him, but how? See The Hold-up Heroes classroom resources. Billy’s having a really bad day. No family, no friends, no fun and now he has to save his four-legged mate, Dusty, from certain death! Will the strangers by the side of the road be able to help him before it’s too late? See One Perfect Day classroom resources. Daisy and her mum have just moved into the Grand Private Hotel belonging to Mr and Mrs Papadopolous. It’s all new and strange, but Nina, Old Dot, the Colonel and especially Rainbow Rose are there to help them make a new life for themselves. But what’s so special about the year 1975? See Daisy Sunshine classroom resources. Ruby doesn’t like working for the Nortons. She wants to go back to Alice Springs to live with her mum. Will Idris, the Afghan boy who works with the camels, help her return home? See The Red Camel classroom resources. Sally Smyth-with-a-y desperately wants an adventure! What better place to find one than spending the summer in a caravan at the beach? There might be pirate ships, or maybe even a beach rescue. Whatever happens, she’s ready for it ... or is she? See Caravan Kids classroom resources. Sam’s Saturday begins like any other but he is soon battling wind, flames and blackened skies as he desperately tries to find his home. See The Day I Was History classroom resources. Things are not going well for Alex. It looks as if he is going to be filmed by a national news crew standing next to his tree-hugging, slogan-yelling, long-haired grandfather. How embarrassing! But perhaps there is a little more going on with Gramps and his friends than Alex realises. See The Other Side classroom resources. See River Boy classroom resources. See The Saw Doctor classroom resources. Ray lied to the school bullies and now he has to find a way into the Olympics before the Leary boys make mincemeat out of him. See Ray’s Olympics classroom resources. See Robbie and the Dolphins classroom resources.